It's not easy being a Saints fan. 40 years and still waiting. I'm not upset with anything that has happened this season. We went from worst to first in one year, but what hurts is getting so close to the big game (Super Bowl) and then get trounced. The great story still has not been finished. So we continue on to another chapter. Thanks, Saints. For six months you prolonged the pain and memories of last year/Katrina amongst all of us in New Orleans. The days of the week went by so much faster. I couldn't wait for Sundays to appear on my calendar because for 3 hours I lost myself in the midst of the Saints dramatic turnaround. I think most of us know how hard it is to get to the NFC Championship game. If not just look at the Cardinals, Lions, Browns for any indication at the gaps in time. While most of us will move on and try to rebuild our homes and lives in the upcoming year we can hold out hope that our Saints can return back to the NFC Championship. It can be done. I know I wanted to almost cry after that game. What has become evident is the fact that I have been riding the emotions of the Saints for six months and now I'm coming down hard. My eyes are finally adjusting to the reality of the Super Bowl, but my eyes will never waver on the view of myself in the mirror every morning looking at the die hard Saints fan smiling back. Thanks for a great season. Black and Gold to the Super Bowl, forever. The Windy City will be expecting a warm Brees on Sunday to blow through town. Got back from New Orleans only to recoup my voice and my heart from a crazy playoff weekend in NOLA. Sometimes it's hard to describe the feeling you get when you witnessed something so amazing that it shocks even the soundest mind people. That's what Saturday felt like. As I stood in the back of the Maple Leaf Bar listening to Bonneroo play "When the Saints go Marching In", I got the shivers all over. People were smiling and I suddenly thought that this was the best dream I've ever had. 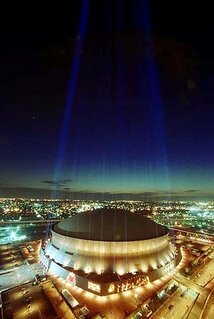 That next morning I awoke to a sudden coolness under my feet as I knew that Saints have inched thier way one game closer to the Super Bowl and hell is about 15 degrees from freezing over. I'm not saying we don't deserve it. My father pointed out to me that the Pittsburgh Steelers used to be the laughing stock of the league. Up until 1970's the Steelers were an inept, always losing, never capable of getting over the hump. 40 years they had been in the league before they won their first Super Bowl stringing together a run that became known as Steeler Dynasty. The Saints are celebrating thier 40th anniversary this year. Maybe history is repeating itself. The 12th man was huge on Saturday. Did anyone notice that the play went on because it was so loud no one had heard the whistle until Baskett caught that pass. Wow!! That was deafening. I loved seeing Duece get the ball. Looking forward to seeing Payton feed him some more this weekend. Drew Brees did a good job of managing the game, making plays when needed. What I'm looking for this upcoming weekend is the Saints defense to show the Bears what everyone else has overlooked, and we need some big plays from special teams. 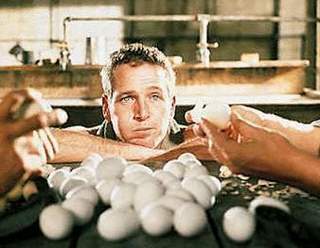 We have to stop that Devin Hester, guy. He's explosive. It'll be hard to keep my emotions in check all week. As I told someone earlier last week, having the Saints play into January is like having Christmas all over again each weekend. You get so excited that you can't sleep. I'll just keep on smiling. Go Saints. Yeah!!! We all know what it's like to miss New Orleans. I've been away from home since the Christmas after Katrina, and since then I've bounced around different parts of the U.S. trying to find something to replace what I've lost. There is little you can do to replace home. You can always find places similar to home or better than home, but nothing reminds me or makes me feel like that special place. So that brings me to this weekend when I will pack up the SUV and travel 1-10 East towards New Orleans for small vacation. It's going to be great being back in the city I love so much for what could be a fantastic weekend of fun and rivelry. 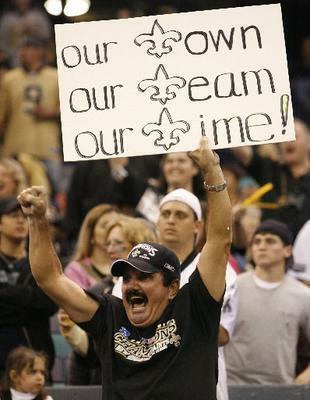 My father, brothers, and I are looking forward to this weekend for the huge playoff game between the Saints and Eagles. It's one of those unspoken things that you miss about being home. The fact that the city has a buzz about it all week in preparation for the game. You can feel it standing in the checkout line at Winn Dixie, cashing a check at Hibernia/Capital One, or eating a muffaletta at Nor-Jo's. Mrs. Veritas is looking forward to this trip too. She is an adopted daughter of New Orleans with a fondness for beignets at Morning Call and an some good old homecooking from my parents house. My biggest thing I'm looking forward too is that feeling as I drive across the Bonnet Carre' Spillway with torches lit up over Norco on one side and seeing a Pelican fly about a foot over the lake on my other side. Then it will hit me. That feeling. The one you get when you come home. An ancient chinese proverb once propheted "Don't walk until you've crawled." Atleast that's what I think the fortune cookie stated. 10-6!!! Who would have thunked it? Buddy D? Jimmy the Greek? Nostradamus? Nope. Not a soul. I think every Saints fan invisions a winning season before it gets started, but realistically deep down inside we look forward to season better than the last. Well this season we just didn't double our wins we tripled them. The New Orleans Saints went from worst to first in a division many had picked us to finish last or second to last. I can't live a lie. I thought that my beloved team would finish 8-8. It was such a big surprise to me that after the third game of the season I felt that we could win much more. I have witnessed many of downtrodden years, many of upsets, many of disappiontments, but nothing has eclipsed the emotions I have felt for the team this year. FAITH!! That's what it takes to be a fan of any team. 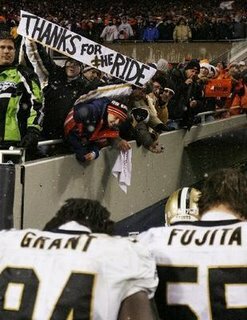 I believe it takes a little more than just faith to be a Saints fan, it means that you and the team become one emotionally. A friend once asked me why I torture myself being a Saints fan. I looked him dead in the eye and said, "I've invested way too much of life to be anything other than a Saints fan. It's what I believe I was meant to be." 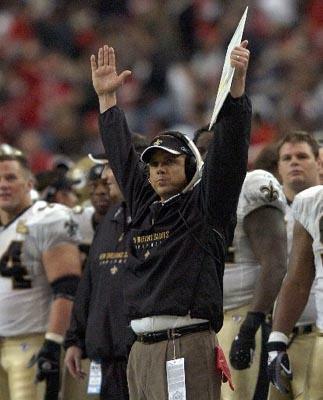 I want to thank Coach Payton for bring a new feeling to the city, to the fans, and to the team. 2006 was a great year for the Saints, but I think that 2007 has the makings of exciting times being a Saints fan. We've got Reggie. We've got Duece. We've got Brees. We've got a defense that is underrated. Look out NFL, these Saints are for real and here to stay. Bring on the tournament! Go Saints.